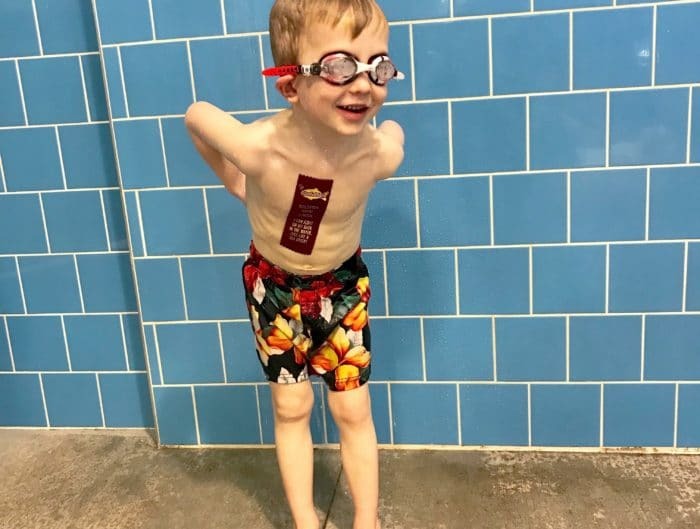 I’ve partnered with Wegmans to bring you this blog post. As always, thank you for supporting CNC! You guys know how much I love grocery shopping, so, of course, I’m psyched that Wegmans has started to make its way to Massachusetts. When the first locations opened, I went on a bunch of fun adventures with friends to visit. Fast-forward to a child and three businesses, my time is much more limited, so I haven’t visited in awhile. However, not too long ago, a closer location opened, so I’ve popped in time-to-time to do our family’s grocery shopping. The store is amazing, massive, and always a good time. I mean, you can seriously get EVERYTHING there! 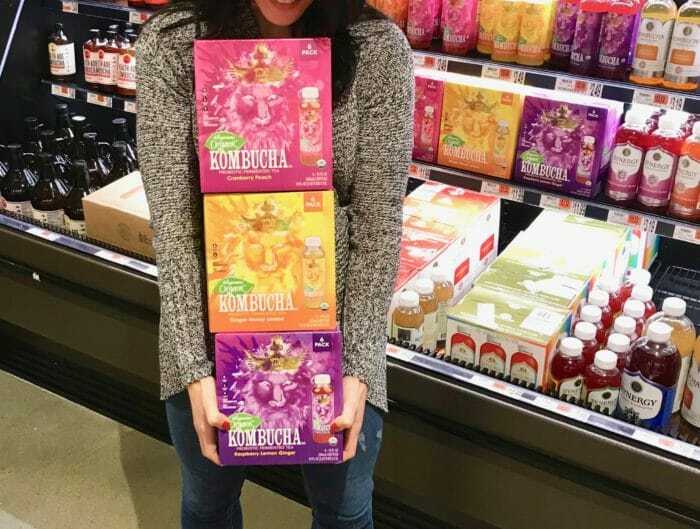 I love that Wegmans is one-stop shopping! 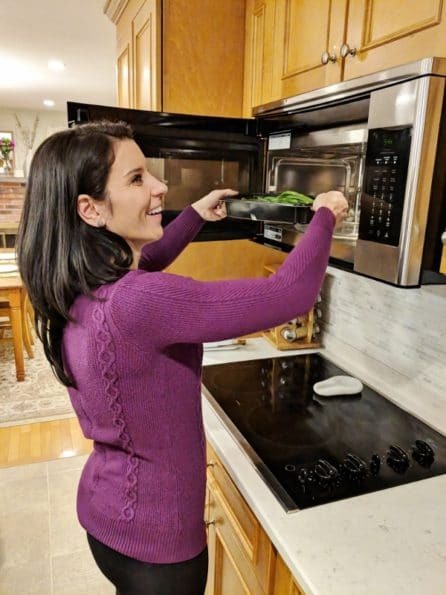 Wegmans recently reached out to me about a blog post featuring their new oven-safe packaged entrées and, of course, I was alllllll about it. 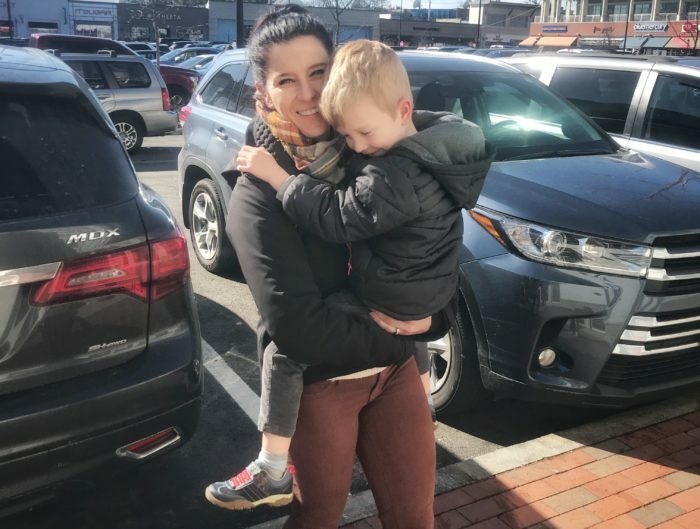 I love a good grocery shopping adventure and our family almost always does our grocery shopping on Saturdays after CrossFit, so I figured it would make a fun outing for all of us. 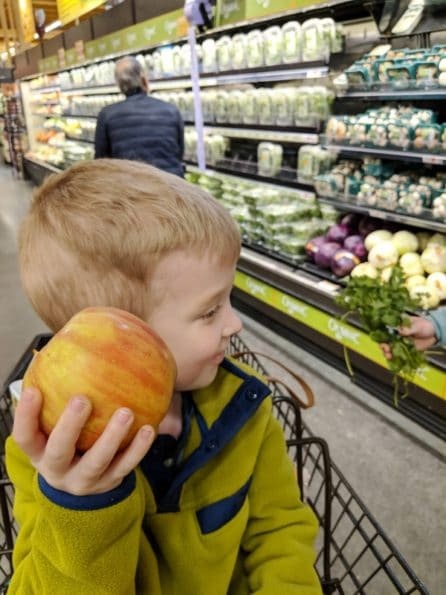 After our usual Saturday CrossFit class, we headed straight to Wegmans to do our grocery shopping for the week – and, my gosh, we had a great time! And fresh flowers for mama! 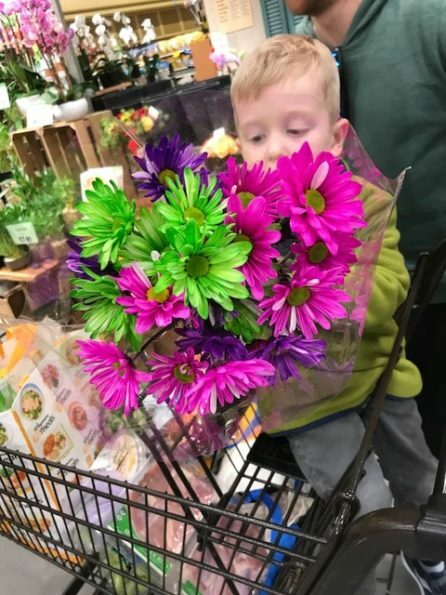 When Quinn saw them, he said, “Whoa, those are bright!” Haha! 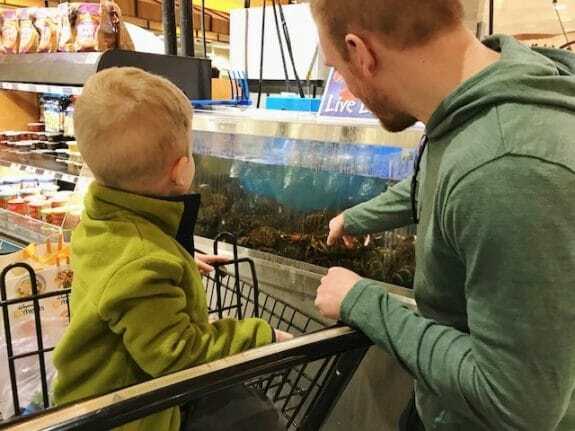 We truly had a blast and decided we really need to hit up Wegmans on the regular to do our shopping. 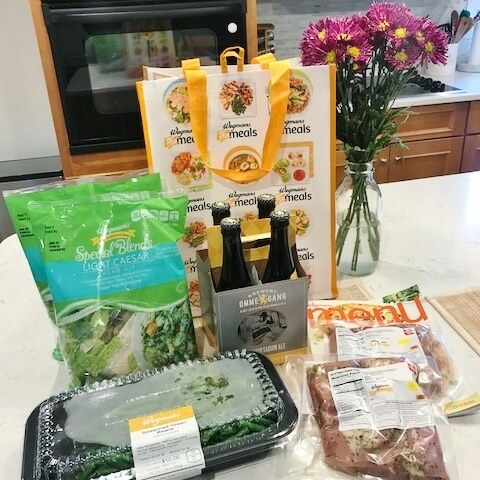 Our Wegmans had so many awesome options for quick and healthy dinners, so it was easy for us to build our meal plan for the week as well as pick up a number of items for the dinner with friends we had planned at our house later in the evening. 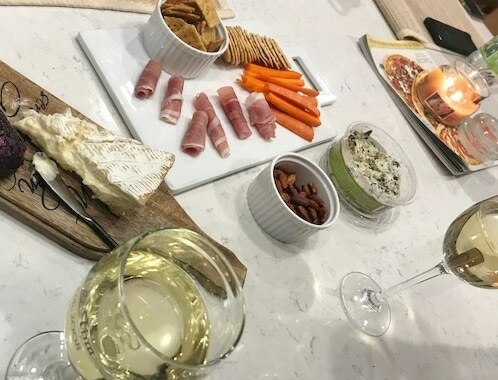 When our friends arrived, we broke out a bunch of appetizers and some adult beverages. We hung out, chatted, and let the kiddos play together. It was such a nice way to spend a Saturday evening. Low-key + friends = THE BEST! 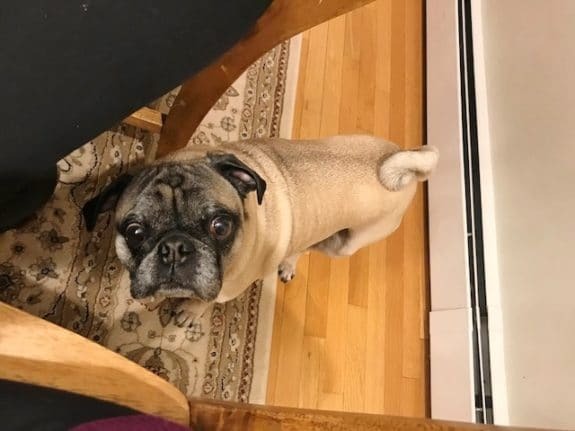 A little while later, I started on dinner, which was courtesy of Wegmans. 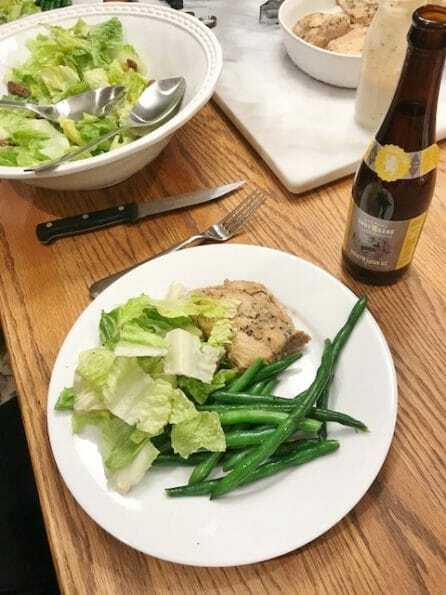 On the menu: Salt and Pepper Chicken Thighs with Light Caesar Salad and Seasoned Green Beans and a beer pairing of Ommegang Hennepin Saison Ale. Holy yum, right? I love that Wegmans offers such convenient and flavorful meal options to put dinner on the table quickly. 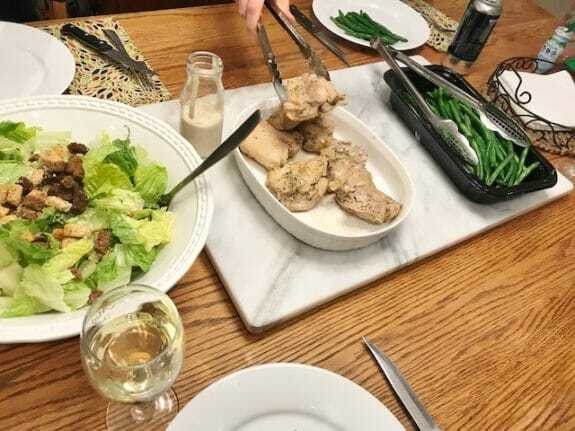 Their oven-safe packaged entrées come in a variety of recipes, including Chicken Cacciatore, Memphis Split Chicken, Pork with Salsa Verde, Asian BBQ Beef Short Ribs, and more. 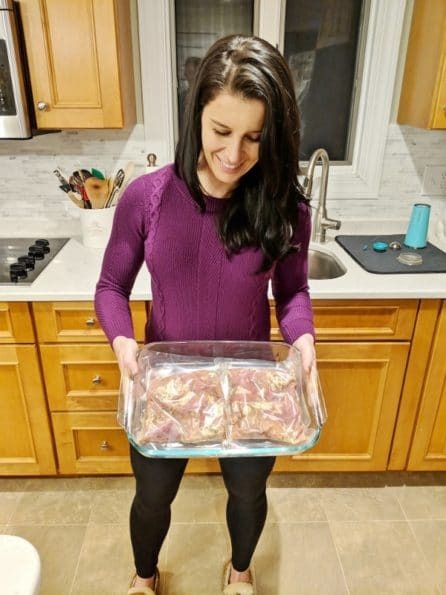 And the preparation couldn’t be easier – just remove the labels, preheat oven to recommended temperature (or in the crockpot for some recipes), place package onto a baking sheet on your oven’s center rack, and set a timer for the recommended cook time. When it’s done, just peel back the film and serve. Easy-peasy! The packaging is designed to cook food safely in the oven. 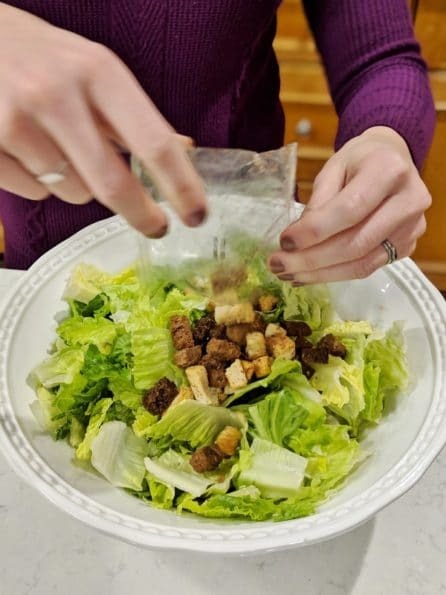 It’s made from Mylar, a food-safe material that won’t burn or melt in temperatures below 425 degrees F. I know it sounds a little crazy, but it’s totally safe. 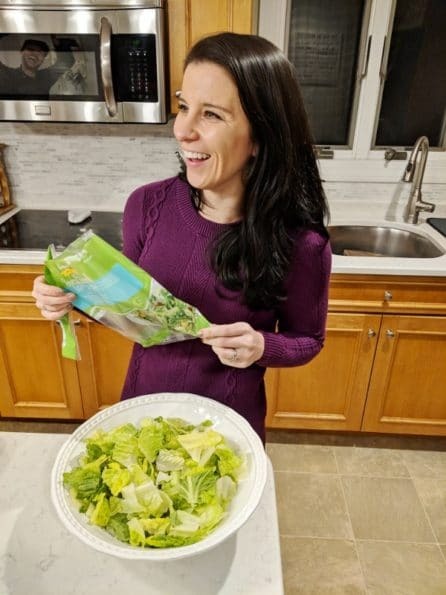 The materials has been around for many years and was tested by Rochester Institute of Technology and Virginia Tech and proven food-safe – and it’s made without any added BPA. I immediately thought how great this packaging option is for people who don’t like to touch raw meat. 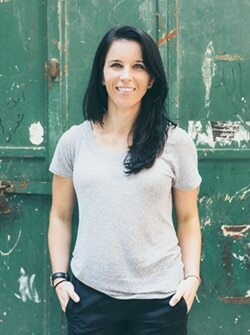 I actually have quite a few nutrition clients, who don’t often eat meat for just this reason, so I’m excited to tell them about it! While the chicken thighs were cooking, I assembled the salad. And popped the green beans in the microwave. Super simple! Another behind the scenes photo – please note Jeff in the microwave reflection. Haha! Start to finish, dinner was done in 20 minutes – and I got to hang out and chat with our friends while doing it all. 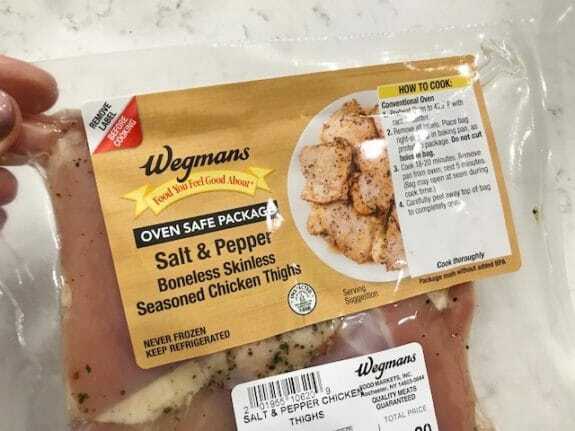 I really loved how simple Wegmans made this meal, especially since all of the seasoning prep and clean up were done for me. 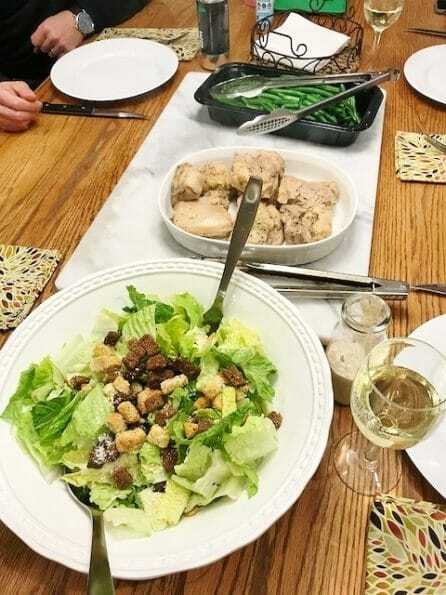 I didn’t destroy my kitchen with pots and pans, bowls and random utensils… everything was ready to go, so I could focus on enjoying the evening with family and friends. 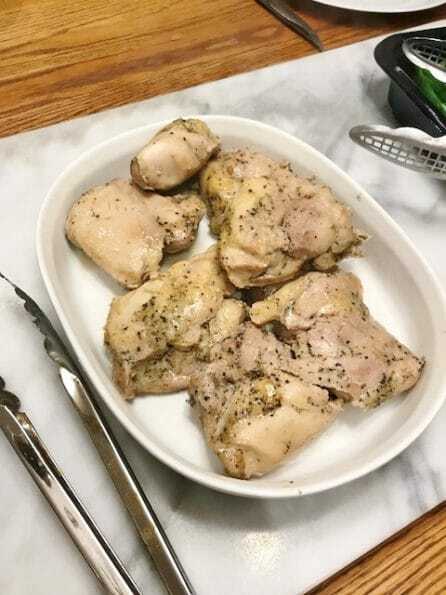 The Salt and Pepper Chicken Thighs turned out so well and everyone raved about them! 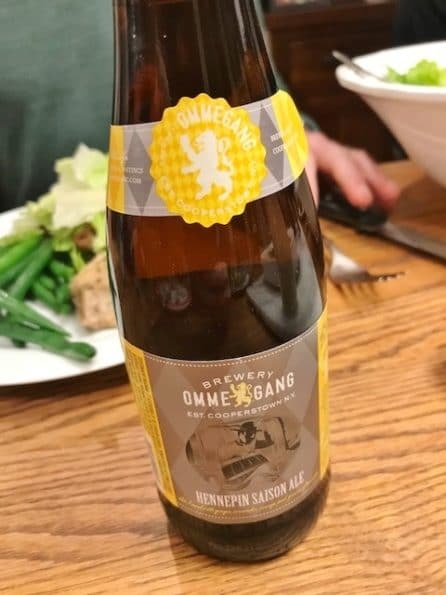 The Ommegang Hennepin Saison Ale pairing was fun and definitely enhanced the flavors of the meal. It was such a great idea for a night with friends. 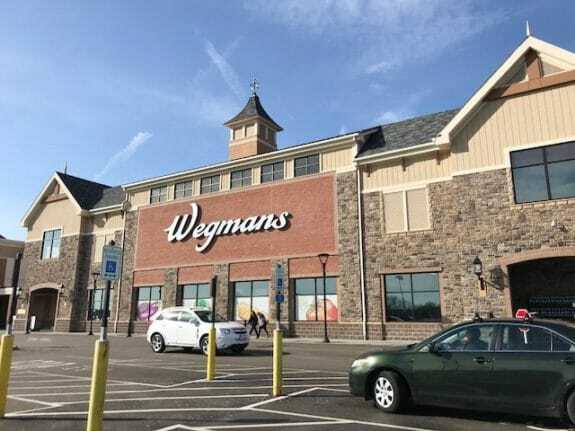 Do you live near a Wegmans? If so, why do you love it so much? Have you tried their oven-safe package entrees yet? I am so happy because Raleigh is getting FOUR Wegmans within the next two years. 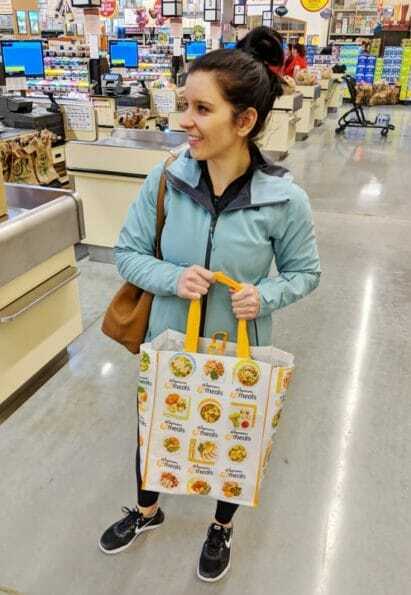 I grew up in Syracuse, so Wegmans was the only place that I shopped for many years! I’m on the south shore too. Where is the Wegmans? We love Wegmans!! I feel like they’re popping up all over the place and I’m completely fine with it. They always have the best meats! 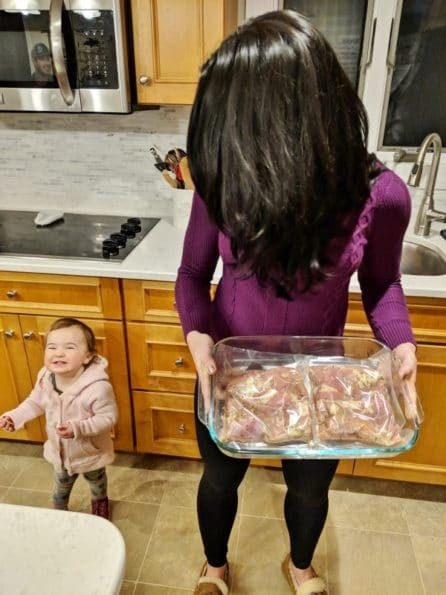 We loved the oven safe meals too! The brown sugar pork was awesome. Love Wegmans! What? Wegmans skipped over the Albany area and is in Massachusetts?! I have only heard how great they are. I live in Canada so we don’t have a white man’s, but I wonder what you think of that store compared to Trader Joe’s? Which do you prefer in terms of pricing and also healthy choices? How about customer service? Which one do you shop at more often? 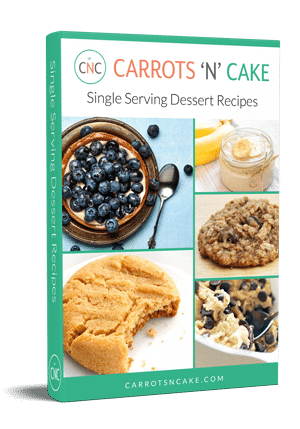 Yum, looks so easy and delish!